The first two papers in this issue have in common the stance that teachers (either of school students or teachers undertaking professional development) need to take account of the knowledge and beliefs that learners bring with them. For Hyung Sook Lee, Jacqueline Coomes, and Jaehoon Yim, the focus is on how teachers’ conceptions of their students’ prior knowledge influence their practice and can limit their use of tasks to help students develop new knowledge. Teachers undertaking professional development are also learners who bring prior knowledge to programmes that mathematics teacher educators such as Mathew Felton–Koestler helped to facilitate. In the case that he describes, his willingness and ability to work with the teacher in a way that connected with her current thinking and respected her perceived needs appeared to be pivotal in catalysing the change that he describes. Although not the focus of their research, both the teachers in Lee et al. and Felton–Koestler in working with teachers had purposes towards which their activity was directed. For Aina Appova and Cynthia Taylor, the purposes of their participants, mathematics teacher educators (MTEs) teaching mathematics courses for prospective K-8 (5–14-year-olds) teachers, are the primary focus. It is their purposes that underpin their practice. Dina Tirosh, Pessia Tsamir, Esther Levenson, and Ruthi Barkai report, in the last paper in this issue, on a specific aspect of the work of MTEs: how they can assist prospective and practising mathematics teachers to learn about using examples in their teaching by considering a case (lesson transcript plus guiding questions) in relation to a range of relevant theoretical constructs and research. Lee et al. considered teachers’ conceptions of the affordances of mathematics tasks in terms of progressing students’ existing knowledge to create new understandings, and their conceptions of the knowledge that students bring to a task to propose a framework that they suggest can explain the ways in which teachers use tasks in their teaching. Based on work with 54 practising teachers over the 3 years of a professional development programme, they identified that teachers conceived of students’ prior knowledge in one of two ways: either as an already existing entity that students need to recall and use or as knowledge to be further developed by subsequent teaching. They also discerned two ways in which teachers viewed tasks: either as contexts in which students apply skills and knowledge that they have already acquired, or as having the potential to develop new knowledge. They described four types of teachers based on the possible combinations of teachers’ conceptions of student prior knowledge and the affordances of tasks and illustrated three of these with detailed description of the practice of three teachers. Only the teacher who regarded students’ prior knowledge as to be developed and regarded the task as having potential to progress that knowledge, provided students with opportunities to deepen and reshape their existing understandings to create new knowledge. Lee et al. are careful to note that their study may not be generalisable to other teachers or tasks, but their framework appears to offer a powerful way to understand why many teachers struggle to translate rich tasks into effective lessons (Sullivan 2008). Importantly, their study is illustrative of increasing sophistication in research on teachers’ conceptions (knowledge and beliefs) that takes seriously the fact that they cannot be considered in isolation if they are to be of use in understanding teachers’ practice. Rather, they interact in complex ways. Although systems perspectives on teachers’ beliefs are not new (e.g. Green 1971), Lee et al.’s paper represents an attempt to explore these interactions in beliefs about just two constructs that powerfully influence teaching. There is enormous potential for gaining insight from exploring the myriad interactions of teachers’ beliefs and knowledge about key aspects of their work. Felton–Koestler’s report of the case of one elementary school teacher, Harriet, engaged in a multi-year professional development programme that included a focus on teaching mathematics for equity and social justice also illustrates the complexity of teachers’ beliefs and unique constellations thereof that teachers bring to their learning. Harriet readily adopted teaching for equity, operationalised as student-centred teaching, but struggled with teaching mathematics for social justice, based on a set of beliefs about the nature of mathematics, the capabilities of her students to engage with social/political issues, and her role as a teacher of mathematics. Factors identified as supporting change in her beliefs about teaching for equity included experiencing meaningful mathematics learning for herself, appreciating the need for something more than her current practice in order to meet curriculum mandates, and observing her students’ success in response to her experiments with different approaches. In relation to teaching mathematics for social justice, the relationships that she formed with the facilitator and fellow participants in the programme, her capacity and willingness to reflect, and having a safe environment in which to try rather threatening ideas appeared to be pivotal. These factors are all present in the literature and, in many cases, have been for several decades (for example, Nespor (1987) concerning the need for teachers to perceive a plausible alternative paradigm in order to change their beliefs/practice). Nevertheless, Felton–Koestler’s paper is unique in its detailed explication of these factors in relation to social justice: an area in relation to which the tensions that Harriet experienced appear to be common and often apparently intractable. Felton–Koestler’s use and extension of zone theory to make sense of Harriet’s shifting beliefs and practice leads him to propose trajectory of change that warrants wider intentional trialling to explore the extent to which it could guide future interventions aimed at supporting teachers to teach mathematics for social justice. Appova and Taylor contribute to a growing focus on MTEs and specifically the purposes and practices of those engaged in teaching mathematics content to prospective K-8 teachers as they relate to the provision of opportunities for these prospective teachers to develop pedagogical content knowledge (PCK). Importantly, the MTEs in their study were ‘expert’ in that they had both expertise and experience in teaching both prospective teachers and school students and were active in mathematics education, for example, by participating in conferences. It is this expertise that appeared to be crucial to the extensive provision of opportunities for prospective teachers to develop PCK that characterised their mathematics content courses. Following conceptualisations of PCK in science education, they tentatively propose the addition of “orientations toward teaching the subject” to their initial conceptual model. This appears to be a positive development in that PCK has received considerable attention in the science education literature, including efforts to achieve a consensus model of PCK for science (Gess-Newsome 2015), from which mathematics educators may be able to learn. The extent to which one might unproblematically be able insert different school subjects into models from other disciplines, in addition to borrowing aspects, as Appova and Taylor suggest might be useful, is an open question. Orientations as used in the literature that Appova and Taylor cite, and as they appear to have adopted it, encompasses knowledge and beliefs about teaching mathematics and refers to the purposes behind observed practice, hence its relevance to their focus. The need to incorporate affective and cognitive domains in mathematics education research has been recognised since at least McLeod’s (1989) seminal overview of affect in mathematics education, but this agenda seems only relatively recently to have impacted conceptualisations of PCK for mathematics teaching through the inclusion of beliefs along with knowledge in the construct (e.g. Beswick et al. 2012; Beswick and Chick forthcoming). There are also resonances here with Lee et al.’s use of the term, conceptions, as encompassing both knowledge and beliefs. In reporting on efforts to help teachers to learn about example use, a specific aspect of PCK, Tirosh et al. were motivated by the dual purpose of developing teachers’ knowledge of examples and their use, and addressing the recurrent problem of connecting theory and practice. The theories that their participants had considered in the course afforded the teachers a vocabulary that appeared to assist them to notice aspects of the teaching represented in the transcript, and to distinguish the kinds of examples that were used, and ways in which they were used and responded to, as well as to reflect on their own existing or prospective use of examples. Tirosh et al. include a discussion of the relative merits of the case that they chose to use in preference to one that might have included more examples or a greater range of types of examples, including non-examples. They suggest that the authenticity of the case, in that the lesson presented was both recent and had been observed by three of their participants, was an important contributor to teachers being able to relate to the case, and arguably more important than other considerations. In so doing, they exemplify the decision-making of MTEs about the examples they offer their learners. In several countries, there have been moves towards school-based models of teacher education (e.g. Menter et al. 2006; Weldon et al. 2013). Although motivated by a desire to improve student learning these initiatives appear to have been premised, at least to some extent, on a belief that the knowledge that prospective teachers need is best acquired in school classrooms. Tirosh et al. 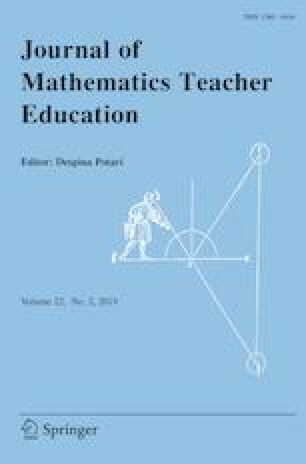 cite mathematics education researchers who have argued cogently that all teacher education should be grounded in clinical experiences, but make the important point that cases using either videos of practice or transcripts can also be effective in bridging school and university contexts as well as offer additional affordances. Consistent with the partnership rhetoric that is often associated with these discussions, Tirosh et al. point out that in addition to bringing classroom practice into university courses, it would be interesting to explore ways in which university courses can be brought into classrooms so that, in their words, “the bridge between theory and practice runs both ways”.